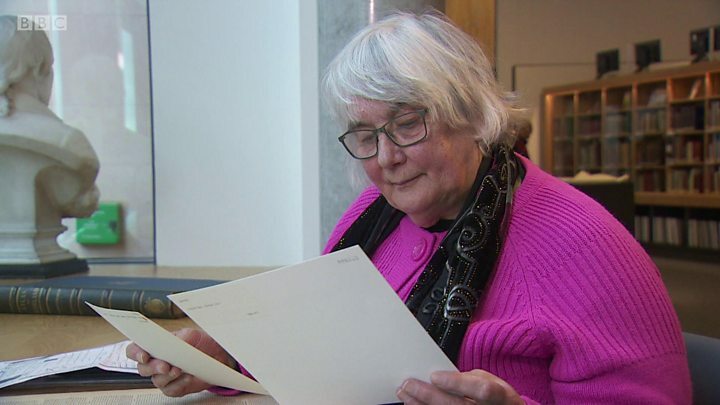 Scottish suffragette Janet "Jenny" McCallum was put in prison after storming the Houses of Parliament in 1908 but her great niece says she is "proud" to have her in her family. Sheila McCallum Perry has been researching her grandmother's older sister and her role in the "votes for women" movement. 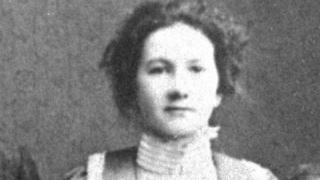 Jenny, the eldest of the 13 children, was born in Dunfermline in 1881. She worked in a linen weaving factory as well as being active in organising the women's suffrage movement in West Fife. By 1908, she had broken away from the Women's Social and Political Union (WSPU), the militant suffragette movement run by the famous Pankhurst women, and had joined Anne Munro in the Women's Freedom League. Jenny abandoned her job in Dunfermline to take up the fight in London. During the demonstration at parliament some of the women got into the corridors of the Commons while others "created a scene" in the Ladies' Gallery by shouting "votes for women" slogans. Jenny was arrested outside parliament where a newspaper report says "four very athletic suffragettes clambered on a statue". The women were taken away by police and fined £5 by the court, which they refused to pay. So they spent a month in Holloway prison. Ms McCallum Perry, from Edinburgh, says: "I'm really proud of having her in the family and I'd like her to inspire more people to vote in the future and for women to play a more active part in politics and general life." Jenny McCallum was unusual among suffragettes in that she came from a working-class family. Prof Sarah Pedersen, of Robert Gordon University in Aberdeen, says most were middle class women. She says: "The suffragettes were asking for the vote as men had it. "Only 60% of men had the vote and very few of those were working class. "The idea was that once the middle class women had the vote they would use it to ameliorate the suffering of their working class sisters." Prof Pedersen says the activities of the Scottish suffragettes have been overshadowed by what went on in London. However, she says there were lots of attacks in Scotland in the later years of the movement, including targeting Burns' Cottage and the Wallace Monument. Prof Pedersen, the author of The Scottish Suffragettes and the Press, says there had been lots of campaigning for the vote towards the end of the 19th Century, mainly using methods such as petitions, writing letters and badgering members of parliament. That changed in 1903 with the establishment of the WSPU. A branch was opened in Glasgow in 1906 and by 1908 its Scottish headquarters had been opened in the city. Prof Pedersen says: "Initially most of the militant action takes places in England so we get Scottish suffragettes travelling down to England to become involved. "For example, the first women to go on hunger strike in an English prison is a Scottish suffragette called Marion Wallace Dunlop in 1909. "She goes down to Westminster and is caught daubing slogans on the House of Commons. She is arrested, goes to prison and goes on hunger strike." By 1910, militant action in Scotland was taking off, with the burning down of buildings such as Leuchars railway station and the grandstands at Ayr and Perth racecourses. The suffragettes are also known to have poured acid in post boxes to destroy the mail and burned the slogan "votes for women" into the greens of golf courses, again using acid. In Aberdeen, Caroline Phillips organised militant action such as attacking the musical hall when the Chancellor of the Exchequer Herbert Asquith was speaking in December 1907. Asquith, the MP for East Fife, who would become prime minister the following year, was a vehement anti-suffragist. According to Prof Pedersen, one of the most militant Scottish suffragettes was Ethel Moorhead. "If there was damage being done to property you could probably guarantee Ethel Moorhead was somewhere there," says the professor. "Every time she was arrested she gave a false name so it is difficult to know everything she was involved in." Ethel was finally arrested and taken to Calton jail in Edinburgh in 1914. She went on hunger strike and was the first Scottish prisoner to be force-fed. "They had been force-feeding in English prisons since 1909 but they refused to do it in Scottish prisons," Prof Pedersen says. "I think they just finally lost their patience." Prof Pedersen says the militant attacks by the suffragettes made some people turn against the cause. She says: "In the initial period in the early 20th Century you get a lot of detail in newspapers about why women were saying they should have the vote and a lot of people were quite sympathetic. "As it becomes much more militant that's when you get people not agreeing so much. "You get a real falling away of sympathy." Prof Pedersen adds: "During the First World War when many of the suffragettes get involved in war work, they are seen to be playing the role of citizens and the vote is reconsidered." The Representation of the People Act 1918, which came into law 100 years ago, gave women over 30 who met minimum property qualifications the vote for the first time. Full electoral equality for women would take another decade, by which time Jenny McCallum had emigrated to South Africa. Her great niece Sheila McCallum Perry says: "I think campaigning for the vote and getting the vote was a way of increasing women's opportunities generally in education and employment. "That generation of women did not have a lot of choice with their lives. "Subsequent generations have done much better from themselves and it has led on from women having the vote to having a say in everything."